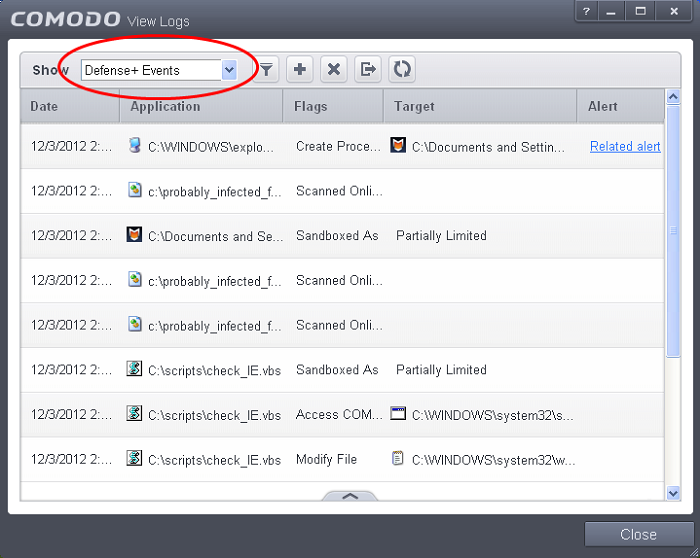 Comodo Internet Security records a history of all actions taken by Defense+. Defense+ 'Events' are generated and recorded for various reasons. Examples include changes in HIPS settings, when an application is auto-sandboxed by Behavior Blocker, when an application or process attempts to access restricted areas or when an action occurs that contravenes your HIPS Rulesets. The Defense+ logs can be viewed by selecting ' Defense+ Events' tab from the 'Show' drop-down of the log viewer interface. Alternatively, the Defense+ log screen can be accessed by clicking the number beside 'Blocked Intrusions' in the Advanced View of the Home screen in the Auto-Sandbox pane. Date - Contains precise details of the date and time of the access attempt. To export the Defense+ logs as a HTML file click the 'Export' button . To refresh the Defense+ logs, click the 'Refresh' button . To clear the Defense+ logs click the 'Clear' button .